You are here: Home / Product Reviews / Babies & Kids / Make Your Own Nickelodeon Dora the Explorer Digi-Book with Walmart’s Dora Apparel! Make Your Own Nickelodeon Dora the Explorer Digi-Book with Walmart’s Dora Apparel! Let’s Make a Dora the Explorer Digi-Book! Well, if your little ones loves Dora just as much as my Mimi does, you know you find yourself heading over to Walmart and buying Dora merchandise. At least I know I do and now have done so for both of my girls. 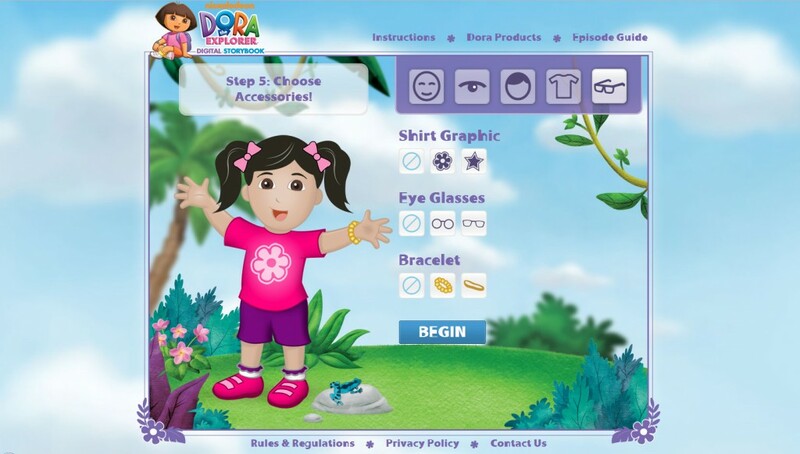 Right now, when you purchase select Dora the Explorer apparel, you will find a special and unique code that you can use to create your very own, super simple to make, interactive Dora Digi-Book online! You can check out the site where you can make Dora and all the characters to life in YOUR personalized Digi-Book, here. Dora is recommended for pre-school aged children and having two girls, both who speak English and Spanish, you know Dora is a favorite in this house. My eldest loved Dora and even had her 2nd Birthday completely Dora-themed. So, we had some hand me downs to Mimi from my eldest and she is gaga over Dora too. I think the show is great for kids to learn a different language, to put on their thinking caps and help Dora on her adventures. Check out Dora on Nickelodeon TV, here. As part of being a Nickelodeon Mom, I was sent the lovely long-sleeved shirt that Mimi is wearing pictured above. 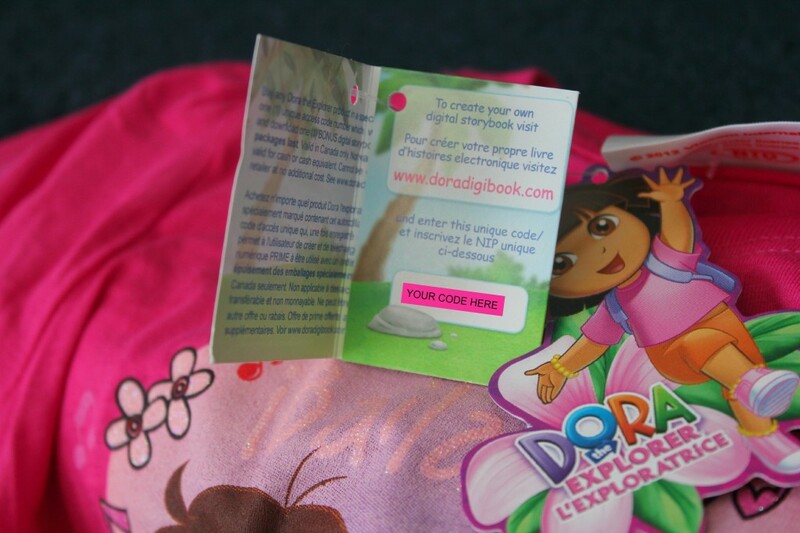 The shirt came with the UNIQUE CODE and we were able to make our very own Dora Digi-Book together. You can see all the apparel at Walmart’s page, here. The codes come on the clothing tags so you get the cool clothes plus a Digi-Book online! Mimi was super excited to have the shirt alone, since it had Boots AND Dora on it, she was even happier when we started making the book together online. After we were done, we were able to share it with our friends too! Making the Digi-Book is SUPER-EASY! Of course, your tiny tyke will need your tech-savvy help to navigate the website but, it is super easy to do. You either choose English/French, design your kid look-alike and your location. You can even choose their favorite color and drink. Once you choose the basics, you are good to go and begin your Dora the Explorer Adventure. The website is really user-friendly, so if computer and websites aren’t your forte–you won’t have much trouble at all. I love how you are able to customize hair, skin color, eye color, clothes color and even t-shirt graphics, glasses and add a bracelet. Mimi loved the whole experience and helped me click the mouse and point to what she wanted. It was adorable to watch! Here is a quick peek into making your own Dora Digi-Book! Win a T-Shirt and Leggings Set and Use the CODE to Make Your Own Digi-Book! Does your little Explorer love reading? Definitely Dora the Explorer. She doesn't really know whats going on but thinks whatever it is is pretty hilarious. oh my daughter will go ga-ga for this!! She's turning 3 next month and it will most definitely be a Dora Party!! thankfully, I still have the Dora pinata from her older's sisters Dora days! My daughter adores Dora right now. My daughters new favorite show is SpongeBob Squarepants.